Uppgift: Se Dada utställningen på MoMA och skapa eget Dada inspirerat verk. While visiting the Dada exhibition on MoMA, one of the things that fascinated me the most was how this was a cultural movement; groups of artists like painters, writers, and musicians, would meet at cafés and exchange ideas, discuss art and how they viewed it. Even if from an aesthetic point of view, I didn’t love many of the pieces exhibited (one of the main purposes of Dada was to be non-aesthetic), this sense of collective vision from a group of artists fascinated me. There was even a couple of different Dada Manifestos written about what the movement was trying to achieve. It should be mentioned this happened around the same time that Karl Marx’s “Communist Manifesto” became widely popular in Europe. The art that visually appealed most to me, were the graphic arts of the various magazine/booklet covers that were created during this period. So I decided to in my project incorporate this sense of art movement and manifesto with the looks of a book cover. 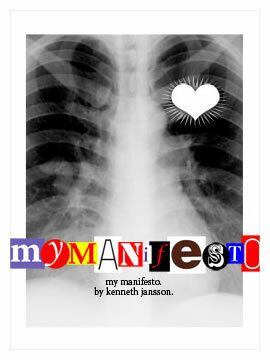 What my manifesto is about should be fairly easy to recognize with the beaming, innocent, white heart attached to the x-ray of an ill person’s body (the person on the x-ray suffers from tuberculosis). In a time when we seem to detest and even mock innocence, and in a time of war, I believe we should make an effort to remain somewhat innocent at heart.